» Has Kitz earned fourth term? Has Kitz earned fourth term? Gov. John Kitzhaber will seek another term in 2014, his second consecutive term and fourth overall. The way Oregon votes lately, he’ll probably get what he wants — but maybe not if enough voters look at what he’s actually done. 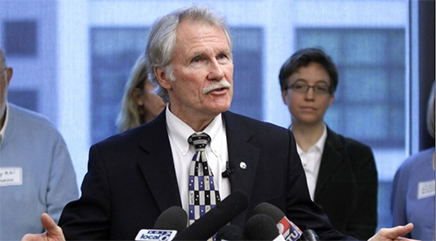 Among other things, Kitzhaber has refused to carry out the law concerning capital punishment. He says no one convicted of aggravated murder will be executed as long as he’s governor, no matter what the law or the jury says. What else? There is the failure of Oregon’s health insurance exchange so far to enroll anyone despite the expenditure of buckets of federal cash and years to prepare for the governor’s single biggest life-long goal, health insurance for all. Then there was Randy Crew, the education boss Kitzhaber hired. Crew got paid $280,000 a year, accomplished nothing for Oregon students, then left for another job. Let’s not forget the special tax deals with Nike and more recently Intel, guaranteeing these companies no changes in tax status for 30 years. What other Oregon employer got that kind of guarantee? Kitzhaber also is pushing ahead with the Columbia River Crossing project despite Washington state’s refusal to help pay. This will likely cost Oregon billions even though the bridge design is too low to allow some upriver traffic and will have to be partially paid off with stiff tolls. Buy Levitra Vardenafil at http://howmed.net/order-levitra-vardenafil/ where you find licensed realiable US online pharmacy. You took the words right out of my mouth! I have been extremely disappointed in the governor’s performance, including the Crew fiasco and his failures to follow the law, plus his spending so much on technological efforts that didn’t work out. Also, he has not been accessible to the press or the people. Simpler question, is there any reason for ANYBODY to be governor of this state for 16 years? Add that his hand picked successor got the gig for eight years in the middle. Its time for some political gentrification. I hope he has a primary challenger.